An established discourse within UK higher education institutions has developed around the pursuit of “academic excellence with impact”. However, the everyday reality is that, in terms of institutional support and opportunities, the impact element is not as embedded as that of academic excellence. Carlos Galán-Díaz has adapted the EDGE Tool, developed to assess universities’ strategic and practical support for public engagement, to research impact activities and collected data on the degree to which impact is ingrained within the purpose, processes, and people of institutions. Findings do indeed show that institutions are still at the relatively early stages of implementing the mechanisms and governance necessary for impact support and development. The publication of initial decisions on the Research Excellence Framework 2021 offered (some) clarity to a previously uncertain higher education sector. HEFCE confirmed that weightings are to change from those used for the 2014 exercise: outputs will account for 60% of the assessment (down from 65%), impact for 25% (up from 20%), with environment unchanged at 15%. Amongst the many refinements are provisions to ensure impact is captured in multiple and diverse pathways, including a specific section of the environment template requesting evidence of “the unit’s approach to enabling impact”. Those in support roles must operate in the knowledge that opportunities and financial support for impact in UK higher education institutions are, on average, more limited than those in place to encourage academic excellence (although at the University of Glasgow we are fortunate to have significant resources devoted to encouraging research impact). This is part of an “awkward zone of encounter”; a term coined by Kirsty Holstead to be applied to situations where there seems to be uncomfortable engagement between established and nascent discourses. The awkward zone of encounter for the impact agenda occurs when the well-established “academic excellence with impact” discourse confronts the everyday reality that the impact element is not as embedded as the academic excellence element, as far as institutional support and opportunities go. 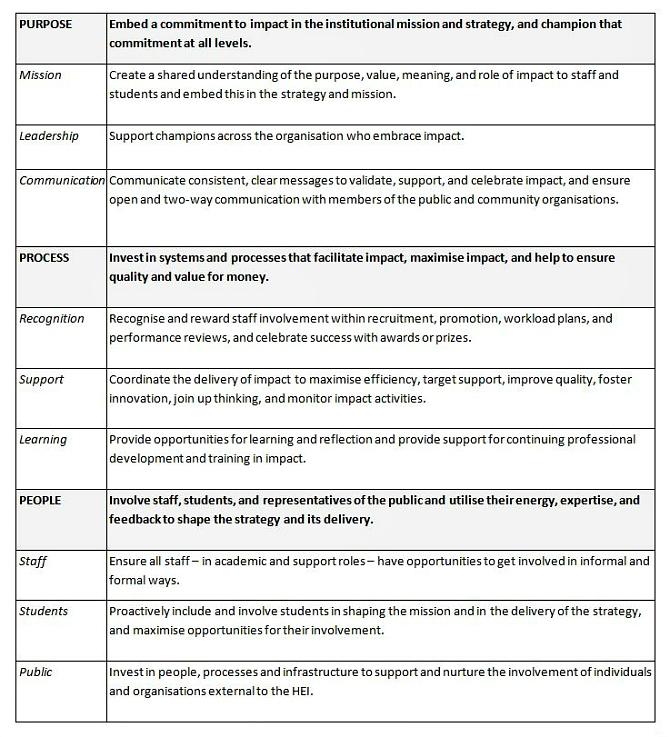 Embedding (the institution has put in place strategic and operational support). It has been used in strategic development by several universities, particularly as part of the Catalyst Seed Fund programme. Table 2: Responses to each of the nine dimensions by the 38 sample institutions. Average scores are given overall, and for the bottom 10% and top 10% respectively. Figure 1: Spidergram visualising responses to each of the nine dimensions by the 38 sample institutions. Average scores are given overall, and for the bottom 10% and top 10% respectively. So, my contention that there is an awkward zone of encounter with regards to the impact agenda is evidenced, to some extent. On average, institutions are still at the relatively early stages of implementing and adopting the mechanisms and governance necessary for impact support and development, even at top-performing institutions. While everyone is adept at navigating the impact agenda discourse (Purpose category), the appetite for making it everyday practice varies considerably across different institutions (Process and People categories). Naturally, institutions will tailor and invest according to their priorities, and the data seems to suggest some patterns to their impact journeys. Among the top 10% of institutions, the dimensions reported as near-Embedded are Learning, Communication, Staff, and Support, suggesting that the groundwork (Process and People) has been done and they are moving towards incorporating Impact into institutional policies (Purpose). 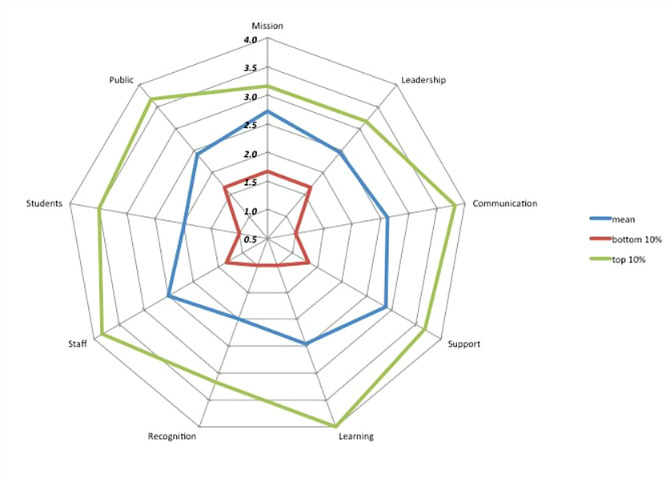 The bottom 10% of institutions show almost the opposite, with activity reported as Developing in the Public, Leadership, and Mission dimensions, and the remainder still in the Embryonic stages, likely suggesting an approach where the “quick wins” are taken on board first and the infrastructure to support impact is still being developed. In brief, this study reveals that the level of preparedness regarding impact support in HEIs is on an improving trajectory towards being embedded. My view is that the biggest challenges are of impact-proofing the next generation (Students) and rewarding impact activities appropriately (Recognition). The former will pave the way for future evaluations, while the latter will allow HEIs to maintain momentum and support impact activities with actual recruitment, promotion, workload plans, and performance rewards (prizes and awards already exist but are not always followed by actual rewards). The author would like to thank Kirsty Holstead and Rose-Marie Barbeau for their continued support when discussing impact issues, including this post; and also Saskia Walcott, who provided timely and constructive feedback at and after the ARMA conference. Carlos Galán-Díaz is an environmental psychologist currently employed as Research Impact Officer at the College of Social Sciences at the University of Glasgow. His research expertise includes impact evaluation, monitoring and reporting; perspective-taking; well-being, and behaviour change.